1 Mr. and Mrs. Ladybug have red wings. Each one has seven black spots. Together they have fourteen black spots. How pretty their red wings and black spots are! 2 Mr. and Mrs. Ladybug have ten children. Each little ladybug has seven black spots. 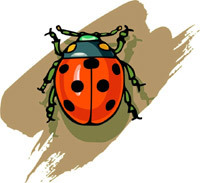 Other ladybugs may have as few as two spots. They may have as many as fifteen spots! Mr. and Mrs. Ladybug count spots. The little ladybugs with seven spots belong in their family. 3 One day the Ladybug family sat down to eat. Mrs. Ladybug had platters of aphids! Ladybugs love to eat aphids. The little ladybugs tucked in their bibs and got ready to eat. 4 "Wait a minute," Mr. Ladybug said. He looked down the long table. "I think there are extra ladybugs here! Who does not belong here?" 5 Not one ladybug said a word. They looked at each other. They shrugged. 6 Mrs. Ladybug counted heads. "I see twelve little ladybugs! That is two bugs too many!" 7 Mr. Ladybug looked grim. "Stand up if you are not one of my children." 8 No bugs stood up. They did not move. Maybe no one would know who did not belong there!